The Musical Magic series begins students in ranges that make sense for individual instruments. Designed to form good habits right from the outset, they balance engaging songs with exercises that consistently reinforce core musical concepts. 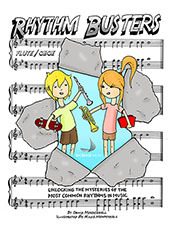 Rhythm Busters takes a logical approach to teaching rhythms to students, at the same time keeping it fun and engaging. Using our method, students understand rhythms so are well-equipped to navigate and perform complex rhythms. Our catalog is comprised of charts that honor the creative essence of jazz, yet remain rooted in its tradition. We believe that music should be engaging at all difficulty levels, and strive to offer compositions that are always compelling to listen to and enjoyable to perform.